Snoring in the middle of the night won’t just interrupt your partner’s sleep. Evidence suggests that prolonged and untreated snoring can lead to sleep apnea, diabetes, and even heart attacks. One mouthpiece company, SnoreRx, aims to combat this common – but potentially dangerous – problem. The SnoreRx mouthpiece is a consumer-grade mouth guard and mouthpiece apparatus that can be purchased without a prescription. SnoreRx claims that their mouthpiece opens up airways by custom molding to your teeth and pulling the lower jaw forward. We’ll be taking a closer look at the SnoreRx mouthpiece, considering SnoreRx reviews, how the device works, and whether or not this product can mean the end of your snoring. What is SnoreRx? How Does it Work? 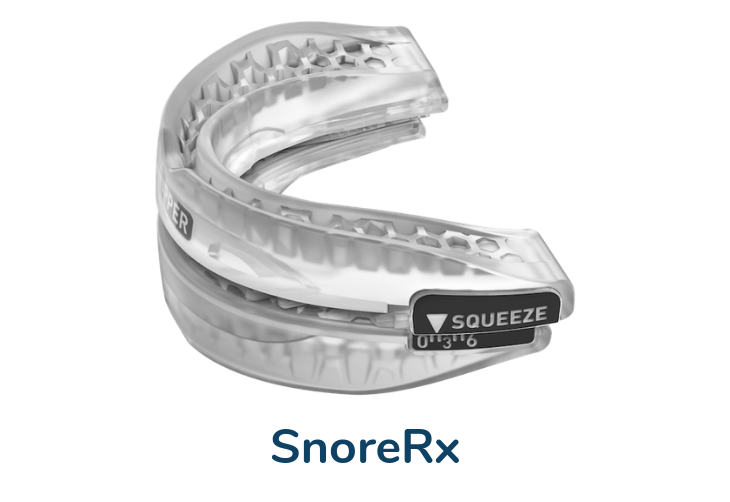 SnoreRx is one of many manufacturers focused on making over-the-counter mouthpieces to prevent snoring and sleep apnea. These devices are often referred to as mandibular adjustment devices, or MADs. MADs are great for those who dislike the feeling of continuous positive airway pressure devices that can prevent comfortable sleep. Instead of focusing on opening up the airways with a mask, MADs alter your body’s resting state. Think about snoring, and how snoring is caused. That familiar snoring sound is from air trying to get through tightened or blocked airway passages. Therefore, we know that opening these airways eliminates snoring. We also know that a reduction in snoring can also lower the risk of developing sleep apnea. Your airways, particularly in the back of the head and the neck, are covered in muscles, bones, and fat, which can make it difficult enough to breathe. SnoreRx works to lift this excess tissue from the airways by forcing the lower jaw forward. That way, restrictions are removed and breathing is much easier. SnoreRx uses custom molds and adjustable plates to make sure that your lower jaw is positioned exactly where it needs to be. No MAD can fully cure snoring for 100% of customers. In fact, SnoreRx brings attention to this fact and claims that their success rate is closer to 90%. Still, the science is in place, and there’s no reason why this product couldn’t help your snoring habit. If you’re looking to be rid of snoring once and for all, we’d recommend using the SnoreRx mouthpiece alongside other preventative measures. For instance, losing excess weight will take a lot of the strain away from the neck and encourage proper breathing habits. In any case, to know whether or not SnoreRx can cure your snoring, you need to test it for yourself. SnoreRx promotes their 30 day no-risk trial period for customers to make sure they can reduce snoring before committing to the cost of the product. Do you Want a SnoreRx Anti Snoring Mouthpiece? Like other MADs, SnoreRx focuses on two major components: comfort and adjustability. Both are equally important for mouthpieces. When it comes to comfort, reports from customers around the globe seem to agree that the plastics are malleable enough to remain comfortably in the mouth throughout the night. Much of this comes from the “boil and bite” method of forming a comfortable seal. This method is simple and easy to do at home. First, the SnoreRx mouthpiece is placed in a pot of water and boiled. This will make the internal plastics soften and easier to handle. Then, the mouthpiece is removed and the user waits for the mouthpiece to cool until it is warm (but not hot) to the touch. Finally, the mouthpiece is placed in the mouth and the user bites down hard. If the steps are followed correctly, the mouthpiece is molded to the teeth and a perfect fit is ensured every night. Not only does the “boil and bite” method ensure comfort, but it also allows users to further adjust their mouthpieces. Other features include incremental adjustments of the mouthpiece’s lateral distance. This means you can control how far forward (or back) your bottom jaw is when wearing the mouthpiece, down to the nearest millimeter. SnoreRx also promotes their “V-Flow” design that allows users of the mouthpiece to breathe through their mouths during the night. Even when the jaw is completely closed around the mouthpiece, it should be just as easy to breathe through the mouth as it would be without it. All of these features come in a semi-translucent design that makes the mouthpiece gender neutral, relatively discreet, and very comfortable after breaking it in. Though, of course, you won’t be able to close your mouth completely. Overall, we think that the design features and simple functionality of the SnoreRx are what make it a prime choice for anyone in the market for a MAD. Although this mouthpiece is larger than we feel it needs to be, it more than makes up for this in performance. If you’ve never used a MAD before or just don’t know about the SnoreRx, we’ve put together a collection of frequently asked questions to make sure you have enough information to make an informed decision. While purchasing a health product like a MAD on your own can seem like a risky affair, there’s nothing the SnoreRx mouthpiece does that is different than other MADs or against what’s known about the science of sleep. SnoreRx carries FDA certification for use orally and isn’t built with any products that could possibly hurt you. The only real fear when using SnoreRx would be discomfort and drooling in the night. As per the website, SnoreRx is designed to last about nine to eleven months—although many have reported being able to use the mouthpiece for well over a year. Generally speaking, the year mark is when we recommend switching out any MAD of this type, SnoreRx included. A decrease in the adjustability and comfort of the device is a good indication that it is time to consider replacing the product. SnoreRx is listed at $99 on the official SnoreRx website. However, bundles are available and regularly sold either on the website or through other licensed retailers. Always be on the lookout for discounts and deals on SnoreRx mouthpieces and other MADs, since these products tend to go through high and low price points depending upon inventory. Provided you’re patient, it is not unheard of to pick up this mouthpiece at half the listing price. Where Do I Buy The SnoreRx Mouthpiece? Buying the SnoreRx mouthpiece directly from the SnoreRx website is the most consistent and reliable place to pick up the product. However, it is not your only option. Many stores throughout the United States sell the SnoreRx mouthpieces, so be sure to shop around your neck of the woods. If you’re still having trouble locating the product, you could always use the SnoreRx store locator. We found that national pharmacy chains are the most likely location to find a SnoreRx mouthpiece. Sleeping with SnoreRx is much like sleeping with any other mouthpiece. After molding the product to your mouth, insert the SnoreRx mouthpiece orally with the correct orientation and in your preferred setting. Then, wrap your lips around the product so that your mouth can comfortably close as much as possible. You won’t be able to completely close your mouth, but you should be able to comfortably sleep breathing through your nose, or through your mouth via the product’s “V-Flow” design. SnoreRx is made out of entirely hypoallergenic materials and is FDA-approved for oral use. The primary components of the mouthpiece are plastics, both soft and hard. Unfortunately, SnoreRx is only offered in one size. While the product is highly adjustable and will fit most sleepers, those with especially small or large mouths may have trouble fitting the product. This is why taking full advantage of the 30-day trial is highly recommended to ensure that this product is going to work as advertised for you. Whether or not SnoreRx – or any MAD, for that matter – is right for you is going to depend upon your sleeping style, comfort with mouthpieces, and desires for such a product. If you’re looking for a mouthpiece that’s easy to use and quickly fits, then SnoreRx has you covered. The one-size-fits-all design is perfect for most people and the price is average to competitive when compared to similar products. Reviews are also mostly positive for the SnoreRx, with most users enjoying the product’s comfort and premium build quality. However, there are a few downsides that you need to consider before buying. For instance, this mouthpiece is larger than most others in this category. 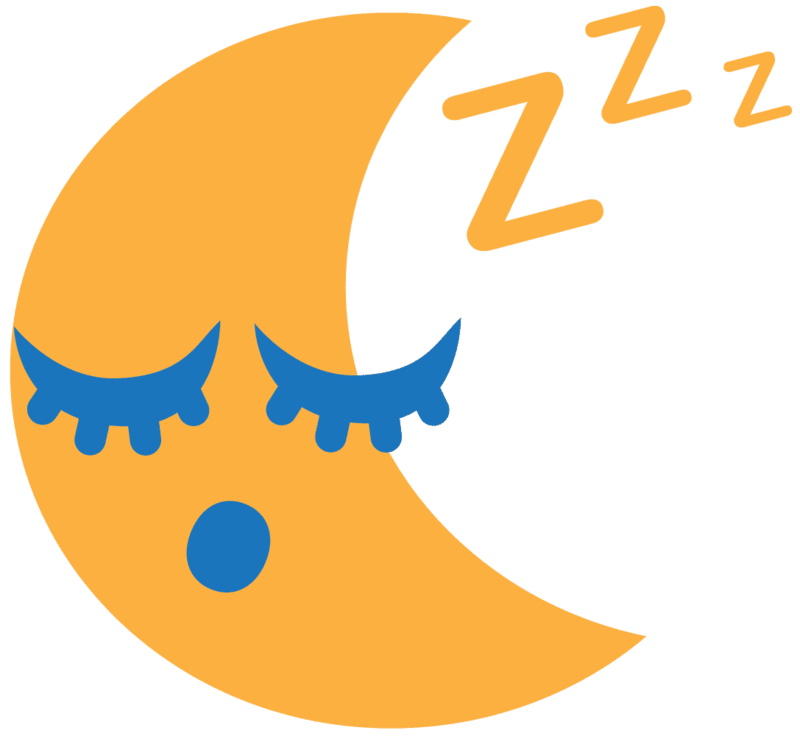 So if your mouth is especially small or you aren’t comfortable sleeping with your mouth somewhat open, SnoreRx may not be right for you. Likewise, the design eliminates those who wear braces and dentures from using the product. This is because the custom-molded design needs to make direct contact with teeth to effectively hold the jaw open. Overall, SnoreRx is a formidable mandibular adjustment device that excels in its simplicity and ease of use. Few other mouthpieces in this category are going to be able to be worn in just a few short minutes, and with the millimeter precise adjustment, you can ensure comfort. Whether or not you settle on the SnoreRx mouthpiece or another mandibular adjustment device, we hope that you find the product that’s right for you. Chronic snoring is a dangerous condition, and the sooner you combat this habit, the better your chances are to avoid long-term damage. If you’re ready to be proactive about your snoring habit, then the SnoreRx mouthpiece is a good place to start.